It is also a strange mixture of acrobatics and rhythm. As one expert on folk dances explained, "There is a Bhavai dance, where the dancer dances (and runs around) with lots of matkas (11 in this case) balanced on top of a glass on his/her head. He also balances spinning thalis on the tips of swords in each hand, dances on broken glass, swords, edges of a thali, etc etc. It gives you a thrill every single time you watch it". Recently wearing his traditional costume, 45-year-old Rajendra Rawal, a dancer from Bapu Nagar in Gujarat, wove magic with his lively performances at the Patiala Heritage Festival. As he displayed the rare art of Bhavai dance, a sequence picked up from traditional kerbaniwesh folk dance, Rawal did a series of constant movements on the dais, whirling non-stop to the accompaniment of drums and flutes. The interesting feature of this dance is that as the performer constantly spins gracefully, the hands do a trick by intertwining a piece of cotton cloth, giving it the shape of an animal like a peacock or pigeon. Usually, Rawal uses a multi-coloured cotton sari to make a peacock, while for creating a rabbit or pigeon, a white cotton piece is preferred. "Cotton gives sturdy shapes," he explains. Rawal says he is into it just to keep alive the tradition that he has inherited from his forefathers. Performing for the last 25 years, Rawal has travelled internationally to make the dance known worldwide. 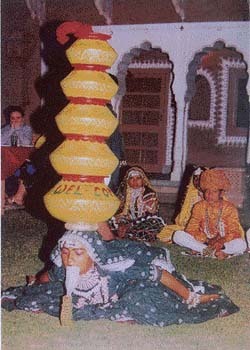 Talking about this unique dance, which he claims is confined within the family, Rawal says that his forefathers used to perform before the kings on auspicious occasions or festivals. He is the fourth generation of the lineage. The history of the Bhavai dance has been traced to the feudal era, four hundred years ago in Gujarat. In the feudal atmosphere of medieval times, dancing was looked down upon. This resulted in talented dancers breaking away from their respective castes and gradually establishing a community of their own known as Bhavai. Tradition has it that four hundred years ago, a celebrated folk dancer called Nagoji Jat founded the Bhavai community. The chief characteristic of the dance element of the dramatic spectacle Bhavai, is the remarkable speed and variety of acrobatic movement. The Bhavais are taught the art of dancing from their early childhood and soon acquire professional efficiency. Theirs is essentially an unsophisticated technique but very skilful. The dance-dramas are usually devoid of any religious sentiments. The themes can be based on the daily life of the village community or on the epic love of Dhola and Maru or on other historical incidents. The dancers are skilful and have a command over many media such as music, dance and acrobatics. The Bhavai dancers set out on eight months’ tour after the rainy season. They travel far to their yajmans (patrons) to perform, and thus earn a living for themselves. The ballad, the theatre and dance-drama together form an artistic exposition, which presents a transitional phase from folk to classical. While the genres are distinct, there are some areas of overlapping and diffusion. In the adjoining state of Rajasthan also Bhavai has taken root and comes out as a graceful dance form presented by veiled women balancing seven to nine brass pots on their heads and dancing with agility. They often perform on crushed glass beds and the lead performer perches on the edge of a sword to sway gracefully with hand movements, raising the tempo and making the spectator awestruck. Closely associated with Bhavai, in that it also forms a part of the folk dance tradition of Gujarat and Rajasthan, is the Bhavai folk theatre.